SK Usman, Maiduguri: Please recall that yesterday, Wednesday 26th December 2018 suspected Boko Haram terrorists attacked the headquarters of 7 Brigade Multinational Joint Task Force (MNJTF), Baga, Borno State, at about 7.00pm. The troops along with their Nigerian Navy counterparts put up a very determined fight to repel the attack throughout the night, while Sector 3 Operation LAFIYA DOLE sent in reinforcement who are in hot pursuit of the terrorists. Similarly, a Search and Rescue team has been constituted. The Nigerian Air Force component has also been mobilised and are engaging the fleeing terrorists. Unfortunately, a naval personnel was killed in action. 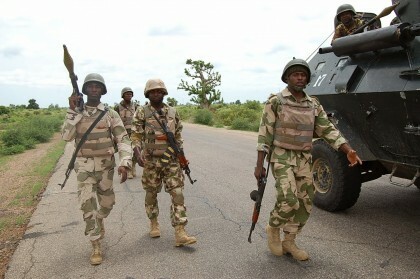 So far, no further details of casualties yet as efforts are on going to clear the terrorists hiding in Baga and environs. We enjoin all to remain calm as the troops conduct clearance and mop up operations. We implore members of the general public to disregard any contrary information circulating on the attack. We will keep you posted with development on the pursuit and mop up operations.